Mainland actor 27-year-old Yang Yang’s (杨洋) popularity skyrocketed throughout Asia after the broadcast of Love O2O <微微一笑很倾城>. Securing a solid fan base with his charming looks, it is no wonder netizens are very concerned about the status of his hair after rumors ran rampant that he shaved his whole head. Sighted in public on January 26th walking around with a slightly shorter hairstyle, he reassured fans that he still had hair. Although Lunar New Year is coming up, his new haircut is a result of something else. 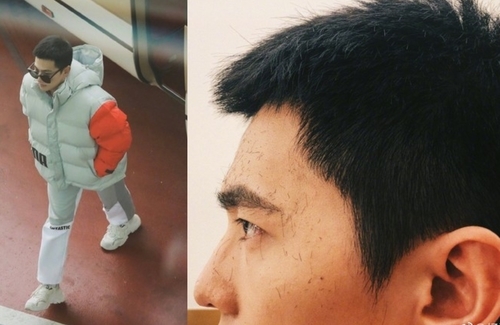 He recently cut off his long bangs to play the role of a cold soldier in TV drama Special Forces <特種兵>. The role is quite different from his previous roles, which is not surprising as he’s been challenging himself with different roles since he became one of the most popular post-90s actor following Love O2O. Yang Yang is actively trying to outperform his previous roles, first with the costume drama Martial Universe <武動乾坤>, The King’s Avatar <全職高手> in which he portrays a pro-gamer, and now he is playing a soldier. Each of his roles showcases his passion for acting, reeling in fans to anticipate his work. Yang Yang is not known for ‘acting chops’. In fact, he’s derided in China as one of the ‘fresh meats’ with poor acting skills.